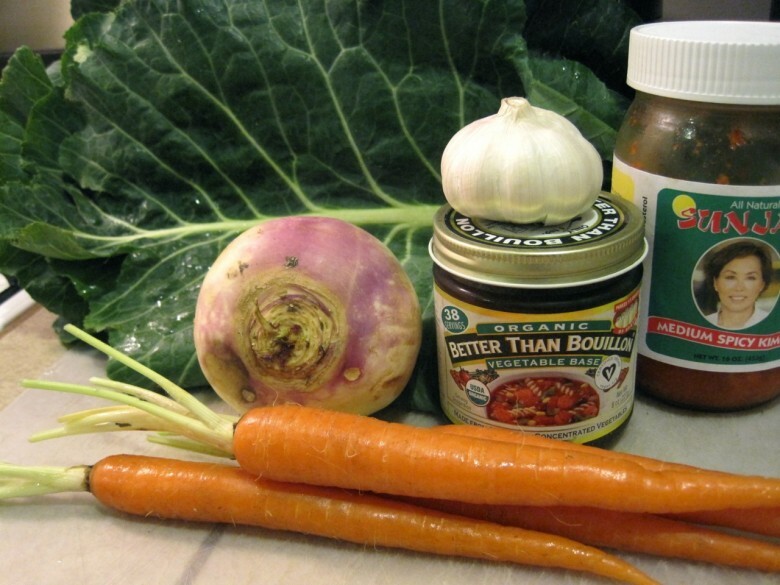 Pictured above are the ingredients for the collard greens: a turnip, carrots, collard greens, vegetable base, garlic and kimchi. Oh… and if you have some red wine in the house, that helps too!! As a side note, Astor Wines has definitely dropped their prices since Trader Joe’s planted themselves up the street. 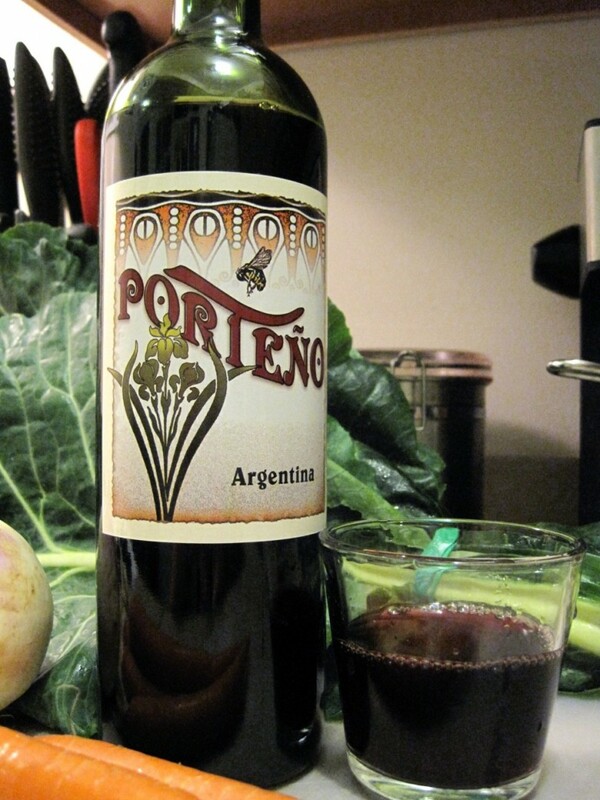 This medium bodied spicy fruity Argentinean delight is under $4, so a glass for me and a glass for the collards isn’t going to hurt the budget!! In a large pot heat a couple tablespoons of oil. Add the collards to the warm oil in batches, allowing them to cook down a bit before adding another handful. Toss in about three cloves of chopped garlic, saute for another minute being careful not to burn the leaves. Add about a 1/2 cup of red wine, toss well for a few seconds and then add about 4 cups of water to the pot. Cover and cook for about 25 minutes. In the meantime prepare the veggies: peel and then chop the turnip into one inch sections, and cut the carrot into large pieces. Add the veggies to the pot, as well as a generous helping of kimchi and a teaspoon full of vegetable base. Cook covered for another 20 minutes on medium low heat, stirring occasionally and checking to make sure the liquid is not evaporating at too quick a rate. If it is, just add more water. 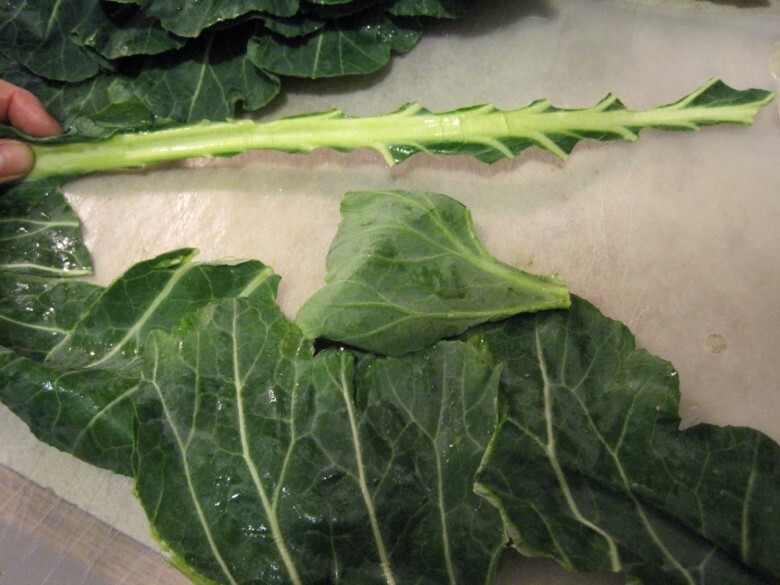 After about 40 minutes you can uncover the collards. Stick a fork in the carrot to make sure they are soft, and cook uncovered for a few more minutes while you prepare the polenta grits. 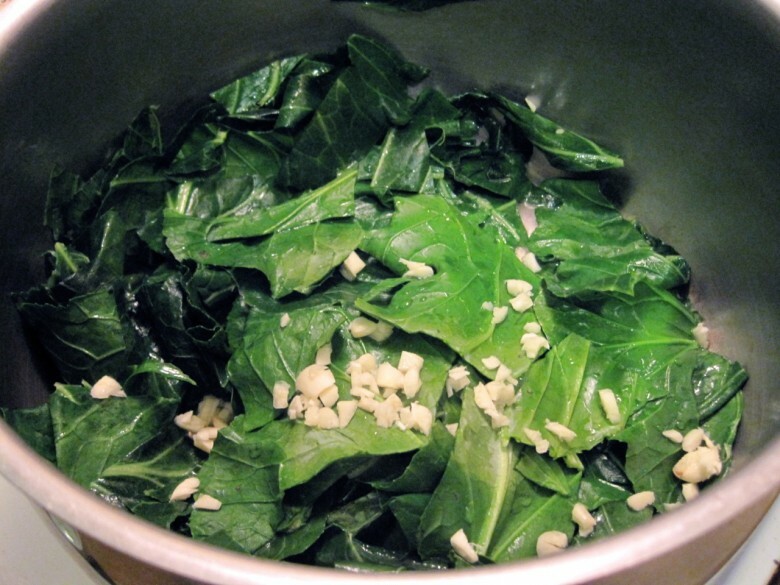 Generally, collards need at least 45 minutes of cooking time to soften up nicely and create a healthy delicious broth (potliquor). 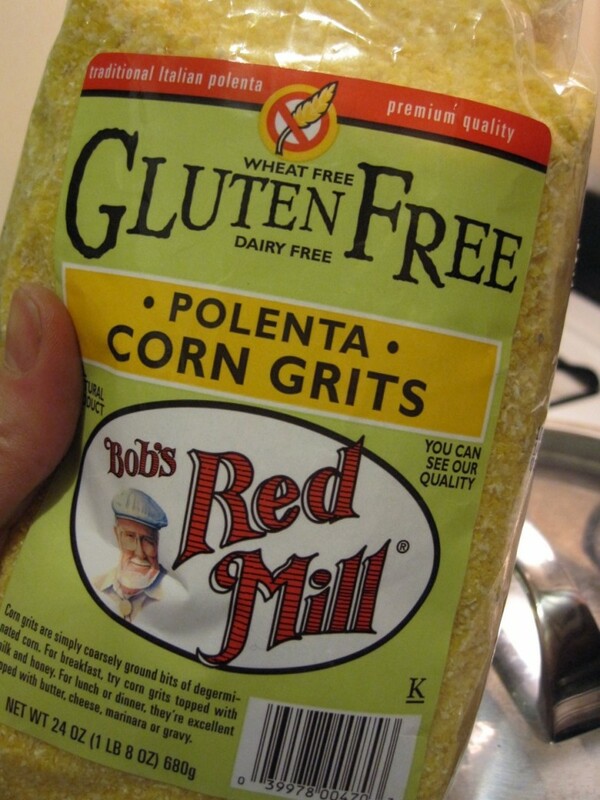 Cook the grits according to the directions for cereal… you’ll figure it out!! 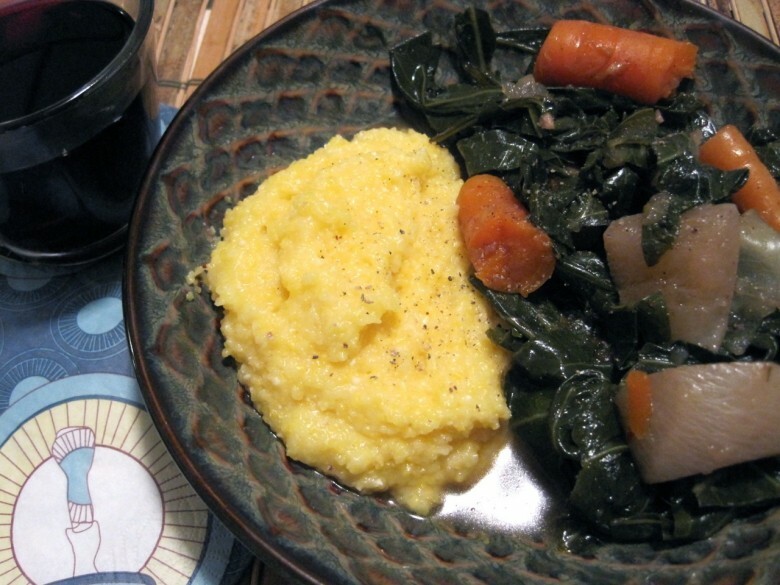 April 15, 2011 | Filed under dinner, gluten free, vegan, vegetarian and tagged with carrots, collard greens, gluten free, kimchi, turnip, vegan, vegetarian. So delicious.. Water spoil in my mouth.. I am really big foodies and cooking is my passion. So i ever make new recipe and dishes in my free time. I will try this cook during this weekend.